Barack Obama’s Approval Index number plunged yesterday after Harry Reid bribed democrats some $1.2 billion to ram nationalized health care through the senate. The Rasmussen Reports daily Presidential Tracking Poll for Tuesday shows that 25% of the nation’s voters Strongly Approve of the way that Barack Obama is performing his role as President. 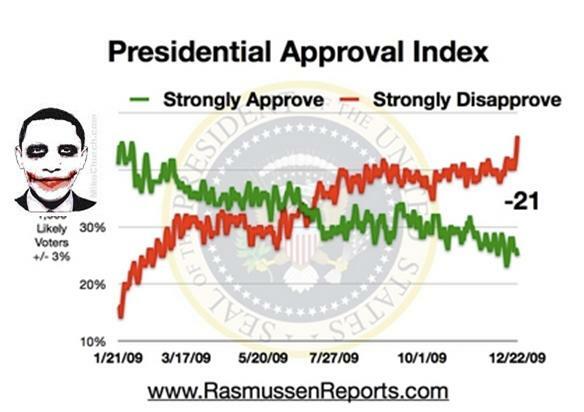 Forty-six percent (46% ) Strongly Disapprove giving Obama a Presidential Approval Index rating of -21 That’s the lowest Approval Index rating yet recorded for this President (see trends). Fifty-three percent (53% ) of men Strongly Disapprove along with 39% of women. Most African-American voters (58% ) Strongly Approve while most white voters (53% ) Strongly Disapprove. Seventy-four percent (74% ) of Republicans Strongly Disapprove as do 52% of unaffiliated voters. Forty-seven percent (47% ) of Democrats Strongly Approve. For the second straight day, the update shows the highest level of Strong Disapproval yet recorded for this President. That negative rating had never topped 42% before yesterday. However, it has risen dramatically since the Senate found 60 votes to move forward with the proposed health care reform legislation. Most voters (55% ) oppose the health care legislation and senior citizens are even more likely than younger voters to dislike the plan.